(Robert Vendettoli/Boulder City Review) Boulder City High School junior Jasmyn Curl had a breakout performance in the Lady Eagles' Jan. 14, 2019, win against Chaparral. 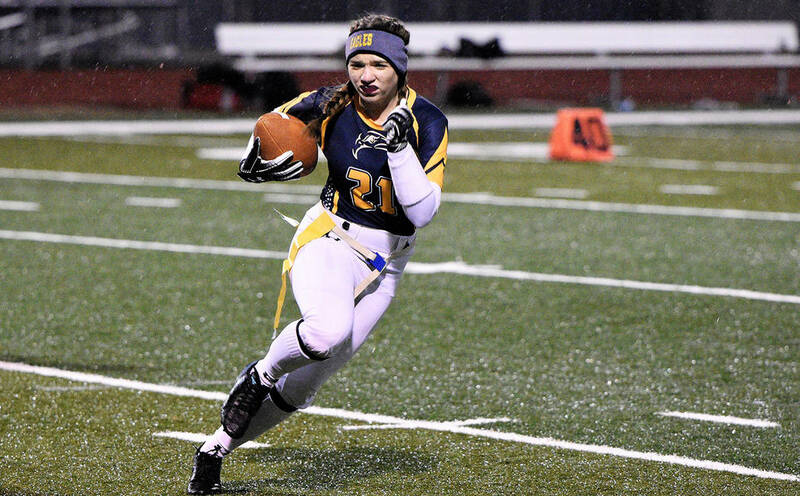 She rushed for 88 yards and scored a touchdown in the 25-12 win. On the verge of a three-game losing streak after losses to Del Sol and Virgin Valley on Jan. 9 and 11, respectively, the Lady Eagles trailed 12-6 at halftime before a 19-point fourth-quarter outburst. Turning the momentum of their season around in a hurry in the second half against the Cowboys, the Lady Eagles played with a sense of urgency after a lackluster first half. Leading the charge offensively, junior quarterback Makaela Perkins threw a pair of touchdown passes, connecting with seniors Ryann Reese and Elizabeth Taggard. A dual-threat option for the Lady Eagles’ offense, Reese also added a rushing score and 67 yards on the ground. Junior Jasmyn Curl had a breakout performance with a rushing touchdown and 88 yards to fuel the comeback effort. Nearly defeating Del Sol, the Lady Eagles were neck and neck with the Dragons, missing on a pair of extra points to fall 14-12. Perkins connected on 19 of 33 passing for 169 yards and a touchdown, connecting with senior Haley Jackson through the air. Reese added a rushing score and 22 yards on the ground, while catching six passes for 51 yards. Blanked by Virgin Valley 20-0, the Lady Eagles’ defense limited the Bulldogs offensively, but surrendered three defensive scores. Feeling confident despite the rout, Reese said the Lady Eagles will be better prepared next time around. Falling to third place in the 3A classification, the Lady Eagles remain focused. They have two games on the schedule in the coming days, at Mojave on Friday and at home against Valley on Wednesday.